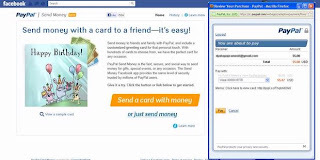 PayPal released a Facebook application that allows users to send money to his friend. This feature was made in line with the increase of social media users and online shoppers. Application with the name "Send Money" contains greeting cards in electronic form. Users can send the card along with words, photos or videos that can be customized with a birthday or other celebration. While sending a card, users can transfer money are bridged by PayPal. "The development of growing social media will make the users have the flexibility to send money as he wishes, whenever and whatever purpose," said Senior Product Marketing PayPal, JB Coutinho, told Computerworld on Thursday (11/17/2011). This electronic card is sent to the "Wall Post" on Facebook recipients, although the messages in this electronic card is privacy. PayPal itself noted there are about 80 percent of PayPal users actually active on Facebook. Online transactions to PayPal users in the United States is free of charge as long as it is done through a bank or PayPal service. If using a credit card, there is a surcharge of 2.9 percent of the value of the transaction. PayPal entered into the application on Facebook is because of the friendship networking site made ​​by Mark Zuckerberg was found between the activity of selling goods Facebook users, ranging from the recommendation of a friend to several well-known brands that make an account on Facebook.